What Do You Do with a Kangaroo? - Audiobook | Listen Instantly! 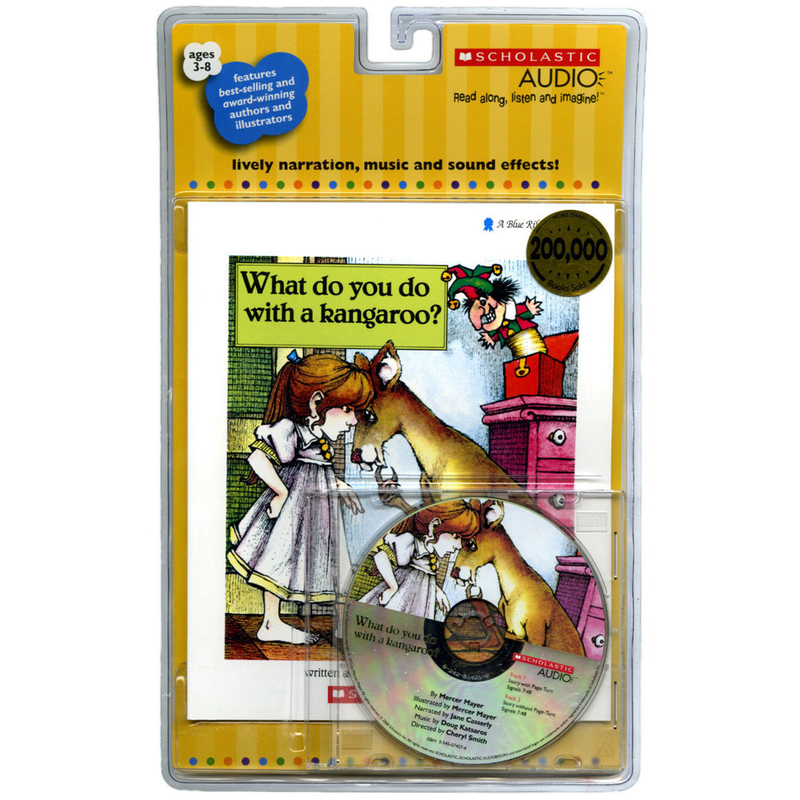 Audiobooks > Juvenile Fiction > Animals > What Do You Do with a Kangaroo? The classic story of a little girl and some very bossy animals, from the beloved creator of Little Critters and There's a Nightmare in my Closet. If a bossy kangaroo jumped through your window AND started telling you what to do AND refused to go away AND had all kinds of other animals joining him...what would you do? Would you tell that kangaroo a thing or two?
" Pretty funny, especially the last page with all the animals and girl in the bed. The illustrations were cute. " " This book...well you have to see it. It is such a corky tale of a girl and a housefull of animals....their requests to her and her responses to them are hilarious!! The pages where there are no words and my boys fill it in with music or their own words make me laugh eachtime we read it. I have told MANY friends about this book and have purchased it for just as many....A MUST READ for childhood!! " " I love this book! I recently purchased it when I stumbled across it at a bookstore. I had forgotten all about it, but at soon as I saw it I knew that I had to have it. You can never go wrong with Mercer Mayer! " " I thought it was funny when the llama was wearing her pants! " " This is SUCH a fun book. " " Read this to my children who were born in Australia and moved to Indiana USA "
" I'm just going to write a little snippit here so my cousin will go out and get this book if she hasn't already. I think of her and her three girls when I read it now-a-days. My boys love it. It's a darling book and I loved it as a little girl. The illustrations are wonderful. " " My very favorite kids book. I love this little's girls assertiveness in taking on the animals that are using her stuff; yet such a sweet ending! So cute and my first indoctrination into feminism :) "
" Yeah! Another early reader that doesn't drive me nuts. Great illustrations and clever text. " " My son wasn't as impressed with this one as I was. But of course, he was reading it to me and he had something else on his mind so the book wasn't that appealing at the time. (I'm sure there was something on t.v. I was making him miss to read w/ mama! LOL) "
" Enjoyable read over and over! " " Is this about manners? Or something else. Not sure. " " i don't think i've ever read/seen mercer mayer's work. Fantastic! there is an unhealded cat that keeps appearing in this book, wonderful. " " Cute ending to a charming story about a little girl who has trouble with animals that keep getting in her way. " " This book is laugh-out-loud hilarious!!! That's all that needs to be said! If you haven't read it, do so immediately. " " This book is great fun. It provides the perfect opportunity to use a lot of facial expressions and emotion, mainly exasperation. My kids love it when I read it to them. It also includes a lot of animals that you don't typically find in children's books. ie. opossum, llama, baby moose. " " A cute Mercer Mayer book I hadn't read before. " " Mercer Mayer's text and illustrations are enchanting. " " Growing up this is one of a faverite books ever. still is "
" One of my all time favorites as a child. " " This was one of my favorite books growing up - and now I get to share it with my children. One of Mayer's best. " " What a fun book. I love the rhythms of the words, the rhyming and non-rhyming, and the imaginative elements. My kiddo loves it too! " " The child in this story is very endearing. She has a tough attitude and isn't afraid to speak her mind. The ending is very sweet and teaches you that compromise works too. I read another review that said it was the reviewers first exposure to feminism, mine too! Oh, and Mercer Mayer rocks! "